Express your creativity through songwriting! What does it take to become your own one-of-a-kind songwriter? Jonathan Kasper offers a program of study to help you turn that idea or tune running through your head into a complete song in any style. Nashville is the songwriting capital of the world. If you live in Music City, you know this is the place where you can tap into your imagination and discover the magic of songwriting. Jonathan has studied with renowned songwriters from the Golden Era of American pop and rock (Jack Keller, Sheila Davis). His educational and performance background includes the Great American Songbook, Broadway, Jazz, Pop and Rock, the Blues, Classical Art Song, Bossa Nova. If you play piano and would like to study songwriting, consider taking some Piano Lessons with Jocelyn Kasper to improve your playing technique and knowledge of music theory. She encourages budding composers to experiment with improvisation and composition. You may then transfer your enrollment to study songwriting with Jonathan Kasper. We recommend that you fill out our easy online Enrollment Application as a first step. Or feel free to give us a call: 615-383-8516. Once we’ve received your completed application, we can schedule an initial lesson. Jonathan’s songwriting curriculum includes comprehensive instruction in both music composition and lyric writing. Create moments of high tension and interest in your songs. Appreciate the value of repetition for better chord progressions, melodies, and lyrics. Understand the difference between song lyrics and poetry. Tell a complete story in under four minutes by utilizing lyrical drama to arc a song from beginning through middle to end. Understand the importance of a hook line, or title line, where to place it, and how many times to repeat it. Employ a twist to convey the element of surprise. Use literary devices such as metaphor and alliteration to make your songs sparkle. Have fun with onomatopoeia and rhyme. Students are also welcome to take shared lessons with friends or family members. Small Group Voice Lessons* are an exciting way for children and adults to explore their creativity with peers. The curriculum allows for both structured learning and free-flowing inspiration. Teens and adults will learn music theory, which will enable them to play basic chords in several keys on the guitar. For more playing techniques, see what’s offered in Jonathan’s Guitar Lessons and Jocelyn’s Piano Lessons. When teaching songwriting to children, Jonathan takes a less technical and more playful approach which includes many of the individual and group activities developed in Kaspermusic’s popular summer Songwriting Camp. 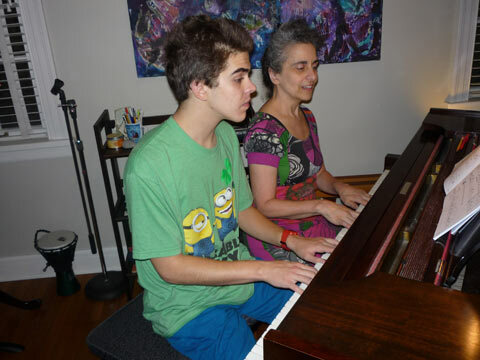 Mr. and Mrs. Kasper team teach a week-long camp for kids who love to write songs. All songwriting students are invited to perform for friends and family in an informal recital at the end of the school year (late April/early May). While one-on-one instruction is appropriate in certain situations, learning with friends in a small group can result in surprisingly fast progress. Children tend to excel with peer learning, and music lessons are no exception. You’ll see improved social and cognitive skills like listening, demonstrating, cooperation and good behavior.